Tomb Raider III: Adventures of Lara Croft is an action-adventure video game developed by Core Design and published by Eidos Interactive. It was released for the PlayStation and Microsoft Windows platforms in 1998. Tomb Raider III is the third title in the Tomb Raider video game series and a sequel to Tomb Raider II. The story of the game follows archaeologist-adventurer Lara Croft as she embarks upon a quest to recover four pieces of a meteorite that are scattered across the world. To progress through the game, the player must explore five locations (India, South Pacific, London, Nevada, and Antarctica) and complete a series of levels that involve solving puzzles, traverse dangerous locations, and defeating enemies. Tomb Raider III is built on an upgraded version of the Tomb Raider engine used by its predecessors. The engine offers better speed efficiency and new graphical features such as coloured lighting and triangular polygons, allowing developers to achieve greater detail and more complex geometry. The game was designed to be more in line with the puzzle-solving gameplay of the original Tomb Raider as opposed to the more shooting-oriented style of Tomb Raider II. Tomb Raider III was accompanied by an extensive marketing campaign and was a commercial success, selling around six million copies worldwide. Although the game received generally favourable reviews, it did not fare as well as its two predecessors, with critics generally agreeing that the game failed to change the same tried and tested formula. Reviewers also noted the game's difficult and unforgiving gameplay. Eidos released an expansion pack, Tomb Raider III: The Lost Artefact, in 2000. The expansion includes six levels set in several European locations. Tomb Raider III was ported to Mac OS computers in 1999 and was released as a "PSOne Classic" on the PlayStation Network in 2011. The player, controlling Lara Croft from a third-person perspective, progresses through the game's Nevada Desert level. Tomb Raider III is a single-player action-adventure game where the player controls the protagonist, Lara Croft, from a third-person perspective through five locations: India, South Pacific, London, Nevada, and Antarctica. Once the player completes the first location (India), the following three (South Pacific, London, and Nevada) can be played in any order before the final location (Antarctica) closes the game. Each location features a series of enclosed levels that involve solving puzzles, jumping over obstacles, and defeating enemies. Most puzzles involve rearranging items, manipulating switches, or pushing objects. As Lara, the player can run, jump, climb, crawl, "monkey swing" across certain overhead frames, and swim and dive underwater for a limited period of time. Lara can also sprint to gain a temporary burst of greater speed while running, which is useful for escaping errant boulders and other immediate disasters. To defeat enemies, the player can use a variety of weapons, including dual pistols, dual Uzis, a Desert Eagle, a shotgun, an MP5 submachine gun, a grenade launcher, a rocket launcher, and a harpoon gun for underwater use. The dual pistols have infinite ammunition and are Lara's default weapons, while the other weapons have finite ammunition and must be found in the levels. At one point in the game, Lara will be stripped of all her weapons, leaving the player defenceless and forced to use stealth, before recovering her pistols later. Lara has a certain amount of health that decreases if she falls from a great height or when she is attacked by enemies. If Lara's health is fully depleted, the player must start the game again from a previous save point. Saving the player's progress on the PlayStation version of the game requires a memory card and consumes a Save Crystal from Lara's inventory. These can be found throughout each level and do not require the player to save the game at the pick-up spot. A significant portion of the game takes place underwater. Some pools are inhabited by piranhas that can kill Lara within seconds, while others have streams with currents that can pull her in a fixed direction, preventing the player from being able to swim back or grab onto a ledge. Furthermore, the water in the Antarctica levels is too cold for Lara to swim through for more than a few seconds. The player can also wade through quicksand, but at the risk of drowning Lara. Some levels require the player to use vehicles. For example, the kayak helps Lara fight her way down rapids in the Madubu Gorge level, while an underwater propeller unit allows her to explore deep water areas in the Lud's Gate level. Other vehicles include a quad bike, a boat, and minecarts. Flares may be used to explore darkened areas. Ammunition, flares, and health recovery items are dispersed among the levels to help players increase their resources. The game also features a tutorial level where the player can practice Lara's moves and combat abilities. A corporation called RX Tech excavates the crash site of a meteorite that impacted on Antarctica millions of years ago and finds strange Rapa Nui-like statues alongside the grave of one of HMS Beagle's sailors. Meanwhile, archaeologist-adventurer Lara Croft is searching for an artefact known as the Infada Stone in the ruins of an ancient Indian Hindu temple once inhabited by the Infada tribe. After taking the artefact from a researcher working for RX Tech, Lara is approached by RX Tech scientist Dr. Willard, who explains that Polynesians came across a meteorite crater in Antarctica thousands of years ago and found that it held incredible power. Using rock from the meteorite, they crafted four crystalline artefacts, one of which is the Infada Stone. They fled Antarctica for unknown reasons, but in the 19th century, a group of sailors travelling with Charles Darwin came to Antarctica and rediscovered the artefacts. The four artefacts were distributed across the globe. Dr. Willard has been able to track the artefacts by using the diary of one of the sailors. Lara agrees to help him find the other three. Travelling to a South Pacific island, Lara encounters a wounded soldier who gives her hints about the existence of a powerful deity. While pursuing the deity, Lara learns that one of Darwin's sailors brought one of the artefacts to the island. She infiltrates a temple and defeats the deity, who has immense power granted by the second artefact, the Ora Dagger. In London, Lara searches for the third artefact, the Eye of Isis, now in the possession of Sophia Leigh, the head of a cosmetics corporation. Lara learns that the corporation has performed experiments on humans in order to achieve immortality and eternal youth for Sophia's personal gain. Lara confronts Sophia in her office and ultimately obtains the artefact. In Nevada, Lara makes her way through a desert canyon and tries to enter Area 51, where the fourth artefact, Element 115, is located in an alien spacecraft guarded by the US government. She is taken prisoner after her attempted break-in fails. Freeing herself, she escapes the security compound and stows away in a truck to Area 51, where she obtains the artefact. After collecting all four artefacts, Lara travels to Antarctica and discovers that Dr. Willard had been using the knowledge gained from the meteorite to perform experiments on his own men, turning them into horrible mutations. Angered by this revelation, she confronts Dr. Willard, who reveals that he is planning to encourage the mutations, only on a global scale, using the combined power of the artefacts and the meteorite from which they were carved. As Lara voices her opposition to his operation, Willard betrays her, steals the artefacts, and disappears into the excavation site. After fighting more mutants and navigating the treacherous ruins of the ancient city built atop the meteorite crater, Lara faces Willard, who has now used the power of the four artefacts to greatly speed up the evolutionary processes of the human body and thereby turned himself into a spider-like creature. Lara deactivates the meteorite by recovering the artefacts, kills the mutated Willard, and escapes by helicopter. Unlike its predecessors, Tomb Raider III was primarily developed for the PlayStation console. Tomb Raider III was developed by Core Design and published by Eidos Interactive as a sequel to the 1997 title Tomb Raider II. Originally, Core Design envisioned Tomb Raider III as a "next generation" Tomb Raider game built on an entirely new game engine with a new animation system. As artist Stuart Atkinson explained, the Tomb Raider team wanted at least two years to develop the game in order to genuinely advance the series, but the producers said that, as with Tomb Raider II, development would be completed in under a year because there was a strong consumer demand for it. For the original team, who had been living with the series' demanding development schedules for two consecutive years, "it was just too much", Atkinson said. As a result, a new team was brought together from other Core Design projects to build a Tomb Raider game for 1998, giving the original team more time to develop their next-generation project. Actual development on Tomb Raider III began in December 1997. At the time, lead programmer Martin Gibbins, who previously worked on the 1996 title Blam! Machinehead, was tweaking the old Tomb Raider engine to build a new game with a stronger emphasis on action and shooting. 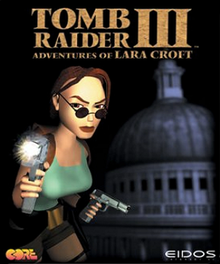 The new team considered Gibbins' additional work to the engine valuable and decided to use it as a basis for the 1998 Tomb Raider game, which was originally intended to be a spin-off called The Further Adventures of Lara Croft. However, as development progressed and more ideas were introduced, the company considered the number of changes enough to justify a complete sequel. The PlayStation served as the lead platform for the game, while the Microsoft Windows release is simply a conversion with slightly improved visuals. As a result, everything was built around the capabilities of the PlayStation hardware, with 16-bit palettes and high-resolution graphics, as opposed to the 8-bit palettes and "pseudo medium" resolution of the earlier titles, Core Design CEO Jeremy Smith explained. The upgraded engine offered better speed efficiency and new graphical features. While both the original Tomb Raider and Tomb Raider II used a grid system where developers could build the levels with a set of blocks, Tomb Raider III's system incorporated triangular polygons, allowing developers to achieve greater detail and more complex architectural structures. The triangles also allowed developers to implement the game's quicksand and rippling water features. The dynamic lighting system was improved with coloured lighting and better water reflection, making Tomb Raider III more atmospheric than its predecessors. The team also implemented new weather effects such as rain, snow, and wind. The game features more particle effects, offering more realistic explosions and smoke. All the textures used in the game were drawn in true colour before being rendered by the graphics engine, resulting in a better output quality. Tomb Raider III was designed more in line with the puzzle-solving gameplay of the original Tomb Raider as opposed to the more shooting-oriented style of Tomb Raider II. The levels were designed to be less linear than before with the goal of giving players multiple routes to complete each one. The game's five locations were decided upon before the plot was conceived. According to producer Mike Schmitt, the team opted to "just take a globe, spin it, and see where it lands, and whether it's an interesting location or not." Once the setting had been decided upon, a storyline linking all the locations was written. Lara's range of abilities was expanded with moves such as the duck, crawl, dash, and "monkey swing". The 1995 film Desperado was an influence on Lara's gun play and new moves. Developers initially considered the possibility of implementing hand-to-hand combat, but the idea was rejected because it would have required giving enemies new combat animations. A specialist was hired to enhance the game's artificial intelligence and give enemies more lifelike behaviour. In previous Tomb Raider games, enemies would simply run at Lara and attack immediately, whereas in Tomb Raider III, enemies can pop out of the dark and attack the player, or retreat back into the level and regroup to attack later. A stealth element partially inspired by Rare's 1997 hit GoldenEye 007 was also introduced, giving players the option of sneaking around and avoid detection. New vehicles that are critical to complete certain levels were added; the team also experimented with the idea of putting Lara on horseback, but they ultimately discarded it. The development of the game took eleven months to complete, and incorporating all the new ideas into the engine was considered the most difficult task of the project. The release of Tomb Raider III was accompanied by an extensive marketing campaign. To promote the game, English model Nell McAndrew was hired to appear as Lara Croft on a press tour across Italy, Spain, Germany, the US, and Australia. McAndrew made appearances on various multimedia outlets, including TV shows, radio stations, and department stores, while Lara Croft appeared on the front cover of most UK games magazines. Other highlights included French TV advertisements for the SEAT car manufacturer and a music video for the German band Die Ärzte. British sports lifestyle brand Animal designed and merchandised a range of Lara Croft clothes and accessories, while Core Design launched its own clothing articles. In May 1998, a demonstration of the game was presented at the Electronic Entertainment Expo in Atlanta, Georgia. The show included a virtual appearance of Lara, which allowed the audience to ask her questions. According to Core Design's PR manager Susie Hamilton, a total of £1.7 millions was spent on the marketing campaign. Tomb Raider III was released for the Microsoft Windows and PlayStation platforms on 20 November 1998. Upon release, some minor bugs in the game were detected, the most significant of which prevented players from completing the Temple Ruins level if they saved the game in a specific area and then went back to that area. Although the bugs in the Microsoft Windows version were addressed with the release of a patch, they remained in the original PlayStation discs. To prevent further issues, Core Design quickly burned new gold discs with an updated version of the game. The game was ported to Mac OS computers in 1999. An expansion pack, Tomb Raider III: The Lost Artefact, was released for Microsoft Windows and Mac OS computers in March 2000. The expansion includes six levels set in several European locations, where Lara must learn of the existence of a fifth meteorite piece called the Hand of Rathmore. In 2011, the game was released as a "PSOne Classic" on the PlayStation Network. Although Tomb Raider III received generally favourable reviews from critics, it did not fare as well as its two predecessors. Edge considered Tomb Raider III "a valid addition to the growing franchise", stating that it offers more attractive graphics and more innovation than Tomb Raider II, while Computer and Video Games described it as "a perfect mix of the exploration and puzzles of the original, and the more-to-shoot nature of the sequel." Other critics, however, felt that the game failed to change the same tried and tested formula. In its 1998 review, IGN said that Tomb Raider III "solves none of its original dilemmas, and as it stands now, the exploration-adventure genre—one that was revolutionized by Tomb Raider—is in the exact spot it was two years ago." Writing for GameSpot, reviewer Joe Fielder highlighted the graphics for their new lighting effects and varied textures, saying that they improve the gameplay experience because they make it easier for players to identify ledges and jump-off points. Douglass Perry of IGN remarked that the upgraded engine made the game look better than its predecessors, but overall considered Tomb Raider III to be outdated, especially when compared to newer engines that were released at the time. Edge felt that the old controls did not suit the more complex environments and criticised the game's lack of narrative and cinematic presentation. The game's difficult and unforgiving gameplay frustrated critics. Game Revolution explained that, while in previous Tomb Raider games "instant death came about if you were trying to rush through an area and you did something stupid", every step in Tomb Raider III "is a potential threat of instant death, no matter how careful you're trying to be." The publication went so far as to call Tomb Raider III "a marketing concept", stating that the game is so difficult that it is impossible to beat without buying a strategy guide. Similarly, Electronic Gaming Monthly criticised the game for being rushed and highly frustrating, noting that it has "too many instances of cheap deaths." The magazine also remarked that the stealth elements in the Nevada levels were ineffective, especially when compared to Konami's Metal Gear Solid. The game's new vehicles, improved artificial intelligence of enemies, and nonlinear gameplay were generally highlighted positively. The Electric Playground said that progressing through the different locations in a nonlinear fashion makes Lara's adventuring more diverse and rewarding. Computer and Video Games's Alez Huhtala praised the fact that players must collect Save Crystals to save their progress in the PlayStation version of the game, as he felt that Tomb Raider II's option to save the game at any time made the game very easy and removed tension. In contrast, Joe Rybicki of Official U.S. PlayStation Magazine felt that the save system was "a poorly thought-out return to one of the most irritating aspects of the original game", making Tomb Raider III "much more frustrating than it should be". Nevertheless, he concluded that players can still "find Lara a rewarding and addictive—if sometimes frustrating—companion." Upon release, Tomb Raider III topped the UK games charts and was the German market's second-best-selling computer game of 1998, behind Anno 1602. At the 1999 Milia festival in Cannes, it took home a "Platinum" prize for revenues above €68 million in the European Union during the previous year. This made it the highest-grossing game in Europe for 1998. As of 2009, Tomb Raider III had sold around six million copies worldwide. ^ a b c d e f g h Douglass Perry (20 November 1998). "Tomb Raider III: Adventures of Lara Croft". IGN. Archived from the original on 22 March 2016. Retrieved 14 March 2017. ^ a b c Core Design, ed. (1998). "Actions". Tomb Raider III PlayStation Instruction Manual. Eidos Interactive. pp. 7–12. ^ a b c "GameSpot's Tomb Raider III Game Guide - Lara's Weapons". GameSpot.co.uk. 1999. Archived from the original on 3 October 2000. Retrieved 3 October 2001. ^ a b Kip Ward (October 1998). "Walkthrough". Tomb Raider III Prima Official Game guide. Prima Games. ISBN 978-0761518587. ^ a b c d e f g "Tomb Raider 3 Review". Game Revolution. 1 December 1998. Archived from the original on 10 September 2015. Retrieved 16 March 2017. ^ Core Design, ed. (1998). "Save Game". Tomb Raider III PlayStation Instruction Manual. Eidos Interactive. p. 13. ^ a b "GameSpot's Tomb Raider III Game Guide - Lara's Items". GameSpot.co.uk. 1999. Archived from the original on 4 October 2000. Retrieved 3 October 2001. ^ Core Design, ed. (1998). "Starting the game". Tomb Raider III PlayStation Instruction Manual. Eidos Interactive. p. 6. ^ a b c d e f g h i j John Davison (August 1998). "Behind Tomb Raider 3". Electronic Gaming Monthly. No. 109. Ziff Davis. pp. 116–126. ^ a b c Thorpe, Nick; Jones, Darran (December 2016). "20 Years of an Icon: Tomb Raider". Retro Gamer. No. 163. Future Publishing. pp. 16–29. ^ a b "Tomb Raider III - The Team Speak Out Part 1 (Page 1)". GameSpot.co.uk. 24 November 1998. Archived from the original on 27 April 1999. Retrieved 18 January 2001. ^ a b "Tomb Raider III - The Team Speak Out Part 1 (Page 2)". GameSpot.co.uk. 24 November 1998. Archived from the original on 9 October 1999. Retrieved 18 January 2001. ^ a b c "Tomb Raider III: Exclusive Developer Interview (Page 3)". GameSpot.co.uk. 30 October 1998. Archived from the original on 18 January 2001. Retrieved 18 January 2001. ^ "Tomb Raider III Preview (Page 3)". GameSpot.co.uk. 1998. Archived from the original on 10 October 1999. Retrieved 18 January 2001. ^ "PC Gaming World's Tomb Raider III Preview (Page 3)". GameSpot.co.uk. 1998. Archived from the original on 21 February 1999. Retrieved 18 January 2001. ^ a b "PC Gaming World's Tomb Raider III Preview (Page 4)". GameSpot.co.uk. 1998. Archived from the original on 21 February 1999. Retrieved 18 January 2001. ^ "Tomb Raider III Preview (Page 2)". GameSpot.co.uk. 1998. Archived from the original on 10 October 1999. Retrieved 18 January 2001. ^ "Tomb Raider III: Exclusive Developer Interview (Page 2)". GameSpot.co.uk. 30 October 1998. Archived from the original on 22 January 2001. Retrieved 18 January 2001. ^ a b "PC Gaming World's Tomb Raider III Preview (Page 7)". GameSpot.co.uk. 1998. Archived from the original on 21 February 1999. Retrieved 18 January 2001. ^ a b c "Tomb Raider 3: Beauty and Brains". IGN. 4 September 1998. Archived from the original on 7 March 2017. Retrieved 6 March 2017. ^ a b Jane Wakefield (1998). "Lara's Millions (Page 5)". GameSpot.co.uk. Archived from the original on 17 December 1999. Retrieved 18 January 2001. ^ a b c "Lara's Year (Page 1)". GameSpot.co.uk. 27 November 1998. Archived from the original on 27 April 1999. Retrieved 18 January 2001. ^ "Lara's Year (Page 2)". GameSpot.co.uk. 27 November 1998. Archived from the original on 8 October 1999. Retrieved 18 January 2001. ^ Jane Wakefield (1998). "Lara's Millions (Page 3)". GameSpot.co.uk. Archived from the original on 7 October 1999. Retrieved 18 January 2001. ^ "Tomb Raider 3". Edge. No. 60. Future Publishing. July 1998. p. 39. ^ "Lara Swings for Three". IGN. 19 November 1998. Archived from the original on 13 March 2017. Retrieved 11 March 2017. ^ a b "Unmined Tombs in Lara's Latest". IGN. 10 December 1998. Archived from the original on 13 March 2017. Retrieved 10 March 2017. ^ "Tomb Raider III: Adventures of Lara Croft". IGN. Archived from the original on 22 April 2016. Retrieved 11 March 2017. ^ "Tomb Raider III: The Lost Artefact". Core Design. Archived from the original on 4 February 2017. Retrieved 19 March 2017. ^ Michael Harradence (27 April 2011). "Inside PlayStation Network - Tomb Raider III: Adventures of Lara Croft". PSU.com. Archived from the original on 13 March 2017. Retrieved 11 March 2017. ^ "Tomb Raider III: Adventures of Lara Croft for PlayStation". GameRankings. Archived from the original on 2 February 2017. Retrieved 19 March 2017. ^ "Tomb Raider III: Adventures of Lara Croft for PC". GameRankings. Archived from the original on 2 February 2017. Retrieved 19 March 2017. ^ a b "Tomb Raider III". Metacritic. Archived from the original on 23 March 2016. Retrieved 18 March 2017. ^ a b c Alex Huhtala (January 1999). "Tomb Raider III". Computer and Video Games. No. 206. EMAP. pp. 36–39. ^ a b c "Tomb Raider III". Edge. No. 66. Future Publishing. Christmas 1998. p. 97. ^ a b c d e Crispin Boyer; John Davison; John Ricciardi; Shawn Smith (February 1999). "Tomb Raider III". Electronic Gaming Monthly. No. 115. Ziff Davis. p. 177. ^ "プレイステーション - トゥームレイダー3". Weekly Famitsu. No. 915. Enterbrain. 30 June 2006. p. 19. ^ a b c d Joe Fielder (24 November 1998). "Tomb Raider III Review". GameSpot. Archived from the original on 17 March 2017. Retrieved 18 March 2017. ^ John Broady (14 January 1999). "Tomb Raider III Review". GameSpot. Archived from the original on 8 August 2016. Retrieved 18 March 2017. ^ Tal Blevins (9 December 1998). "Tomb Raider III: Adventures of Lara Croft". IGN. Archived from the original on 7 April 2016. Retrieved 18 March 2017. ^ a b c d Joe Rybicki (January 1999). "Tomb Raider III". Official U.S. PlayStation Magazine. Vol. 2 no. 4. Ziff Davis. pp. 90–91. ^ a b c Jules Grant (7 January 1999). "Tomb Raider III Review". The Electric Playground. Archived from the original on 29 April 1999. Retrieved 18 January 2001. ^ "UK Top Ten". IGN. 11 December 1998. Archived from the original on 13 March 2017. Retrieved 10 March 2017. ^ "News; Bestseller '98". PC Games (in German). Computec Media AG. March 1999. p. 20. ^ Michael McWhertor (23 April 2009). "Tomb Raider Lifetime Sales Show Off Lara Croft's Biggest Hits". Kotaku. Archived from the original on 3 March 2016. Retrieved 10 March 2017.